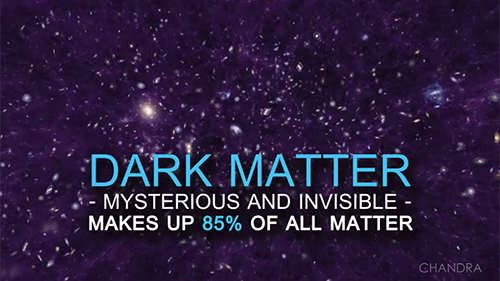 Dark matter is the mysterious and pervasive substance that constitutes most — about 85% — of the matter in our Universe. Although scientists have made progress in better understanding dark matter, the true nature of this invisible material remains elusive. NASA's Chandra X-ray Observatory plays an important role in the search to learn about dark matter. One way that astronomers have used Chandra to investigate dark matter has been through the study of a mysterious signal seen in the X-ray data. 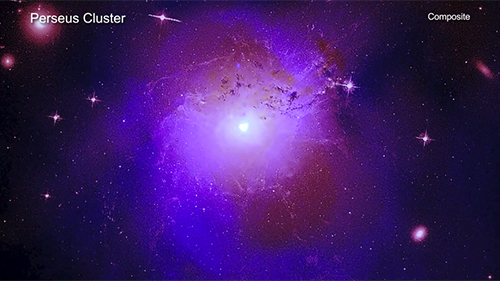 In 2014, astronomers reported they found a spike of intensity at a very specific energy in Chandra and XMM-Newton observations of the hot gas in the Perseus and other galaxy clusters. This spike, or emission line, is at an energy of 3.5 kiloelectron volts, or keV (pronounced "kay-ee-vee"), and could not easily be explained as emission from known elements. Therefore, one possibility was that this line was produced by dark matter particles. Naturally, determining the true nature of dark matter would be a huge discovery. And as Carl Sagan famously said, extraordinary claims require extraordinary evidence. Therefore, astronomers have been working hard both to replicate the initial results and also provide explanations for all of the observations connected to this original finding. Now a new team of astronomers has provided an innovative interpretation of the observations surrounding this 3.5 keV line. They propose that there is another mechanism at work, namely the absorption of X-ray light by mystery particles. If this is true, then it's possible that the 3.5 keV line may, in fact, be produced by dark matter particles. While these ideas need to be confirmed with future observations, it may be that the prospect of determining the nature of the darkest of matter may never have been more so bright. In 2014, astronomers detected an unusual feature in X-ray data from Perseus and other galaxy clusters. Since then, Chandra and other X-ray telescopes have taken more observations to replicate the finding. The existence and interpretation of this spike in X-ray light has been controversial and difficult to explain. Now, a new team of astronomers has reanalyzed these and other data and come up with a fresh take on this debate. They suggest that dark matter particles in the galaxy clusters are both absorbing and emitting X-rays. If the new model turns out to be correct, it could provide a path for scientists to identify the true nature of dark matter.